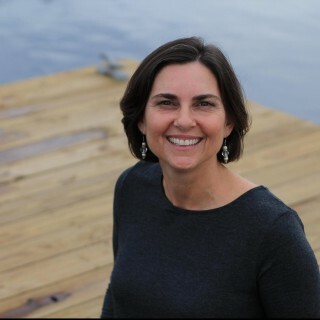 The Blended Blog ladies are sharing about gardening through different climates. I’ll be sharing about gardening in NE Florida. While some of my friends to the north are just emerging from the cold, we have been in growing mode for a few weeks now. When full summer hits it will be too hot for much of anything, but for now I’m enjoying watching my garden grow. 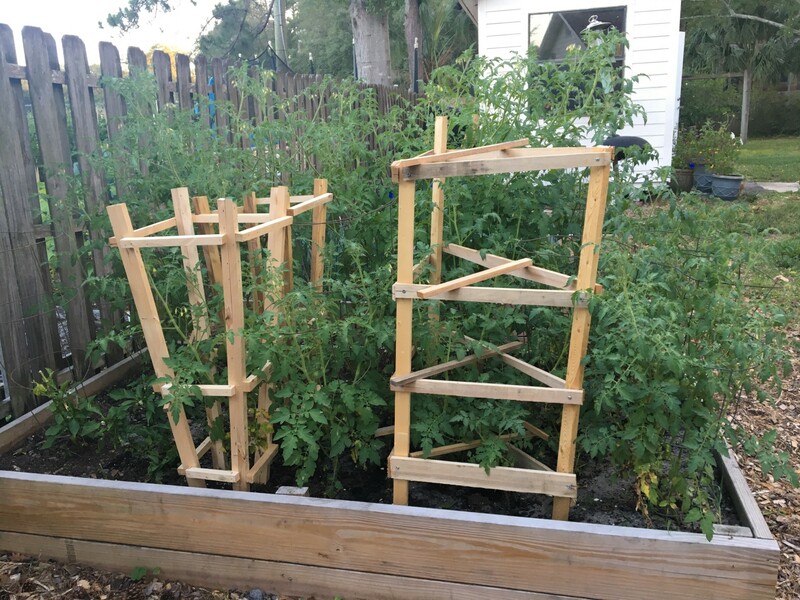 I shared how we put in these raised beds last year and I just love them! In the first bed, I planted tomato seedlings my neighbor so generously gave me. I didn’t have enough metal cages so Dad made some wooden ones. The metal ones are in bad shape. Next year I want these. 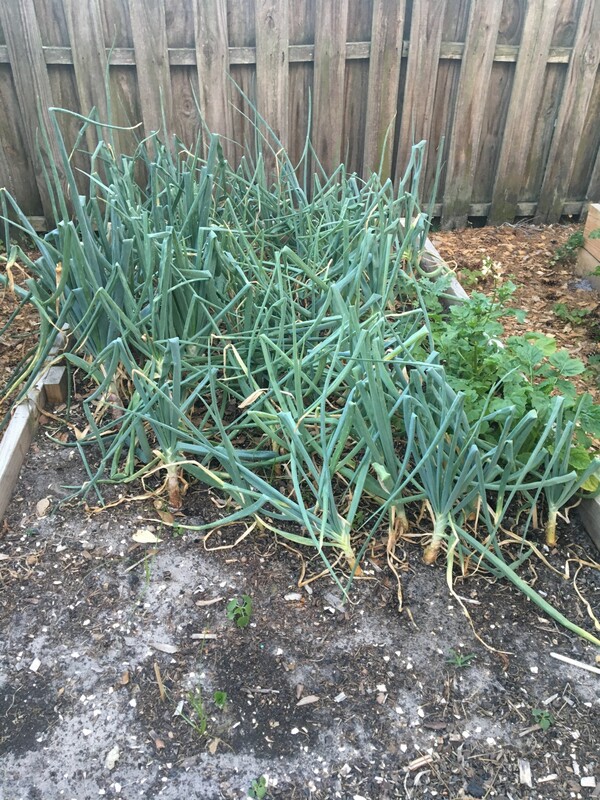 The onion bed is doing great. We’ve been using onions all winter long. Apparently I planted them too deep because they didn’t become a bulb. They are just huge scallions but still tasty. I tried planting some lettuce. They came up but then died. I’ve been traveling so much that I think they didn’t get enough water. I really need to put in sprinklers back here. I will transplant the basil into the front empty part. Hopefully this week! The herb bed is doing well too. The parsley is huge and some is starting to bolt. The mint is spreading out and greening up nicely. We’ll have lots of mojitos this summer! I need to trim it back around the thyme and sage before it smothers it! 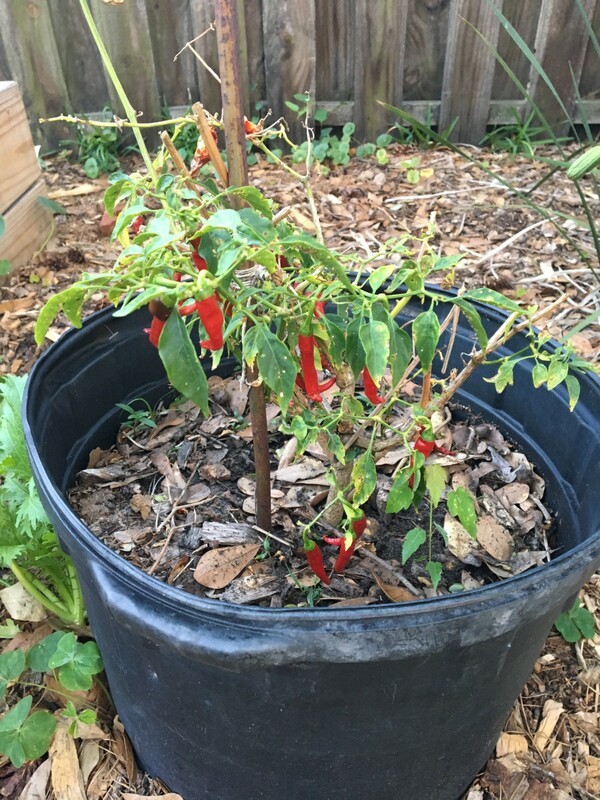 This little cayenne pepper plant survived the winter and after I trimmed it back it’s producing peppers again! You can see where the mizuna self-seeded into the mulch is and growing! I’ll need to add that to my salads this week! Do you grow a garden? What do you like to grow? Now go visit Lana at My New Happy and Leslie at Once Upon a Time & Happily Ever After to see what they are up to in their gardens! One lives in Washington and one is in Texas! I bet their gardens are very different than mine! I wonder if I can grow all of the same veggies and herbs you can grow in Zone 8 there? I have always wanted a raised bed and remember ooing and ahhing over yours last summer. Suppose PC would shoot me if I asked to dig up the yard yet again to accommodate a vegetable garden? I guess with a raised bed, there’s no digging involved, though, huh? Even better! Look into square-foot gardening raised beds. That might be your answer! The plants will need lots of water though! I was amazed when we were visiting the desert in Israel to see how they grow crops using drip irrigation. You CAN grow stuff in the desert besides cactus! Just emerging from the cold is right – we had some frost last week, so it’s not safe to plant anything quite yet, but I appreciate this inspiration for a few weeks from now! But you can probably grow stuff all summer whereas my stuff bakes! What do you usually plant? Oh, I’m so excited for you! I took my daughter to Italy last year to visit my family but it was only for two weeks. My husband doesn’t want me to be gone more than that! 😉 A whole month sounds wonderful! Is the whole family going? Nice garden beds you have. You’ll be able to use the veggies and herbs for your cooking. When we are home for the summer, I usually plant tomatoes and herbs, and potted flower plants. Our warm season is so short, sometimes it’s not worth the effort and cost to plant our own garden. I’m so jealous of all the veggies you can get out of your garden! Those raised beds make it so much easier! The weeds used to be out of control! I love the raised garden beds. My hubby grows a little herb garden but in an indoor hydroponic contraption. If I had a larger yard I would put in raised beds. I really should just make our front lawn into a garden. Haha. Oh does he use one of those vertical hydroponic things!? I tried to get my husband to buy one but he makes a good point: we can garden just about year-round! I love seeing what the garden looks like in different areas! Wow! You are full on gardening for sure. Gorgeous plants and perfect weather I’m sure for a great garden every year. I loved raised beds. If my straw bales don’t work out this year, I’m trying this next! I love mine! Keeps the weeds down, easier to manage! I didn’t know onions wouldn’t make bulbs if they were planted too deep! I think the only time I’ve tried to grow onions we just used them as green onions when they were small. We’ve had an indoor “Aerogarden” herb garden this winter. 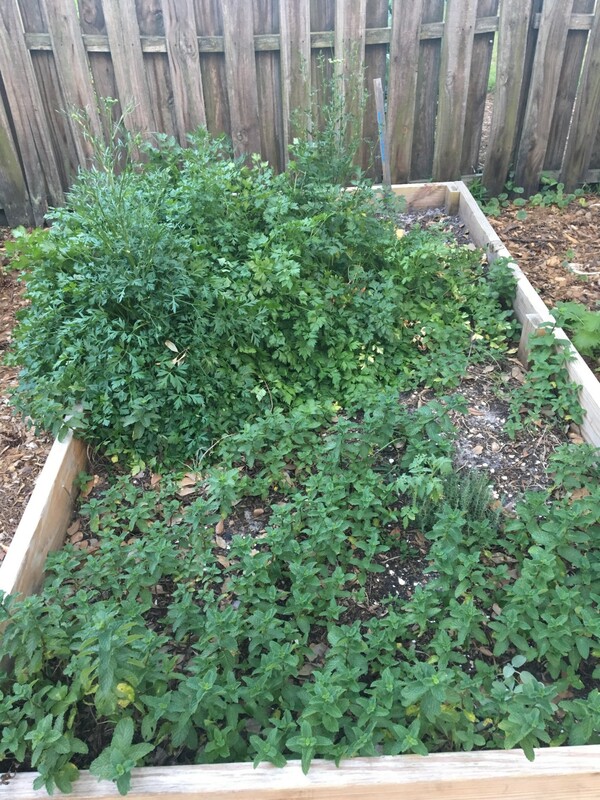 The herbs are WAY too big to use now, so I want to transplant them outdoors and then cut them way back for the summer season. I’m thinking of planting lettuces in our Aerogarden system in the kitchen next. I think it would be easier to keep it trimmed back since we use lettuce more often than herbs. We have several Earthboxes for our outdoor “garden.” The girls want to plant some things but I’m not sure what we’ll end up with. It’s just now finally warm enough to even try to plant outside. What kind of herbs are in your aerogarden? Is that one of those vertical hydroponic thingys? I saw them at conventions and thought I wanted one but then my husband pointed out that we have a really long growing season and why have that? He had a point.